My photo shows a halaka, or storyteller, in the Jemaa el-Fna in Marrakech. Every evening there are several halakis continuing the time-honoured oral tradition of storytelling in this great public space. They are true performance artists who attract large local audiences of all ages in a society where adult illiteracy is still high, and in Morocco over the centuries halakis have played an important role in communicating knowledge traditions. Novelist Reynolds Price described how “a need to tell and hear stories is essential to the species Homo sapiens… it is second in necessity after nourishment and before love and silence… millions survive without love or home, almost none in silence”. 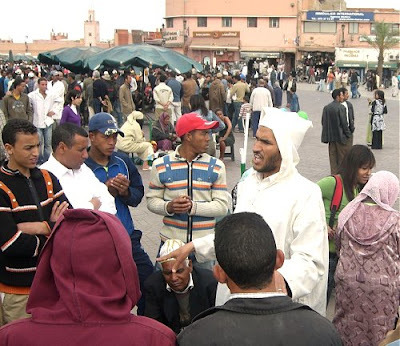 But, despite this, technology and cultural change are threatening the halakis of Jemaa el-Fna, and, in the same way, technology and cultural change are threatening classical music. In ancient cultures such as the Moroccan Amazigh words have magical powers, and classical music has the same magical powers to comfort and inspire. Which is why this year we are celebrating Wagner, Britten and Verdi, three great storytellers. But operas are not the only way to tell stories, and every piece of music – even the most abstract contemporary work – tells a story through the extra-musical cues of who, what and when that connect listener and music. But, as described in a recent post, technology and cultural change are stripping those vital cues from both recorded and live performances. Which means that, shorn of its narrative power, classical music becomes just another expendable entertainment. Today millions still survive without love or home but very few in silence, thanks in part to social media which is an adapted form of storytelling. So if classical music wants to reach new audiences, it too must become a storyteller for the digital generation. I took the header photo some years ago in Morocco, and in a few days I will be returning once again to that seductive but sometimes sinister land of storytellers, djins, music and great knowledge traditions. While I am away On An Overgrown Path will take a break and switch to ‘dynamic view’ presentation; this will make available the blog's very long tail of stories, one of which portrays some of the few who today still survive in silence. Also on Facebook and Twitter. Photo is © On An Overgrown Path 2013. Any other copyrighted material on these pages is included as "fair use", for the purpose of study, review or critical analysis only, and will be removed at the request of copyright owner(s).